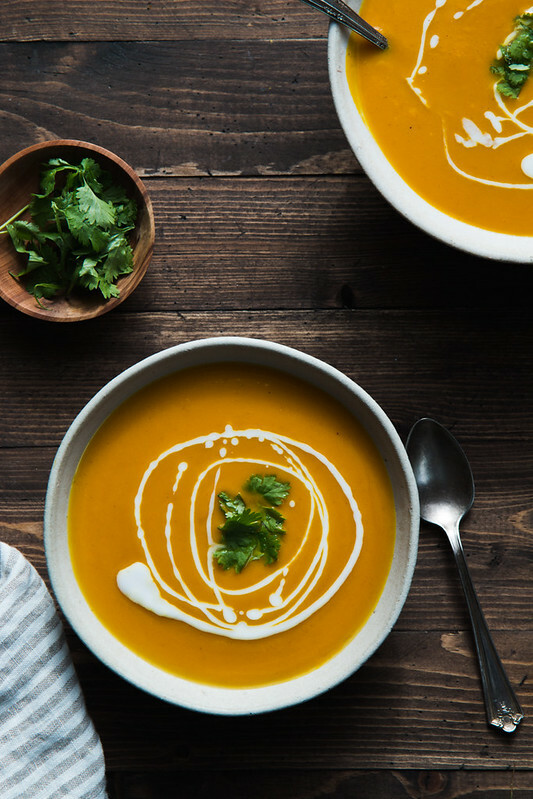 This Kabocha Squash Soup is rich and velvety without the need for dairy. 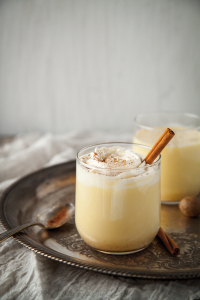 Jump to the recipe here, or read on and get the recipe at the bottom of this post. I’m not ashamed to admit that I once bought a pair of pregnancy pants for the express purpose of wearing while eating. You would think I’d be more embarrassed to tell you that, but those pants were the comfiest I have ever owned, and part of me is still convinced it was a brilliant idea. Why should expecting mothers have all the fun of elastic waistbands? Every year The Husband and I visit his family for the holidays, and it seems like every year the food is better than the last. His are a people that are not afraid of butter and carbs, which is not so much a complaint as it is a compliment. As a result, I have an increasingly harder time resisting filling my plate with seconds, or thirds. Oh, I couldn’t possibly find room for dessert… but okay, twist my arm why don’t you. 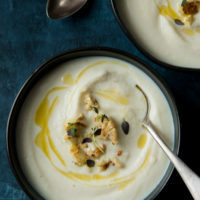 If you’ve been reading WCFF for any length of time, you know that I adore winter soups. They are stupid easy to make, delicious, and almost always healthy. 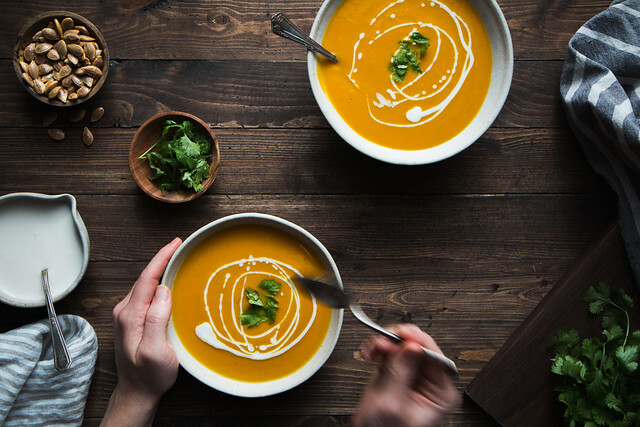 This kabocha squash soup is all of those things, and the rich, creamy texture makes it feel super indulgent, while still being light and easy on the digestion. 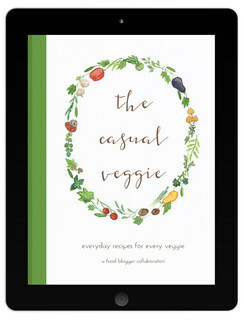 Basically, it is exactly what I need to break up the heaviness of all that holiday eating. After a few bowls, I almost don’t miss that pair of pregnancy pants. For a long time, this roasted butternut squash soup with sage has held the title of my favorite winter soup — which is saying a lot, because I’ve made many soups and I love them all — but now it’s lost its spot at number one, because I just can’t get enough of this curry spiced kabocha squash number. If you’ve never had a kabocha squash, then you’re in the same boat I was until very recently. They are a squat variety of pumpkin, with a dark green skin and bright orange flesh. 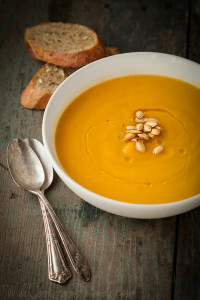 The flavor is a little heartier than other squash, almost like a cross between a pumpkin and a sweet potato, and that drier, more potato-like texture makes for the most velvety soup. The sweetness of the squash and coconut milk are balanced beautifully by the heat of the curry powder, and with a little fresh cilantro or squeeze of lime to finish, you get what is quite possibly the most addictive bowl of soup I have ever met. I’ve decided that squash and curry are like peanut butter and chocolate. Good on their own, better together. This soup was inspired by this kabocha curry dish from my friend Carey of the blog Reclaiming Provincial. Her recipe called to me the moment I saw it, and after having the opportunity to taste it, I knew I needed more kabocha in my life. 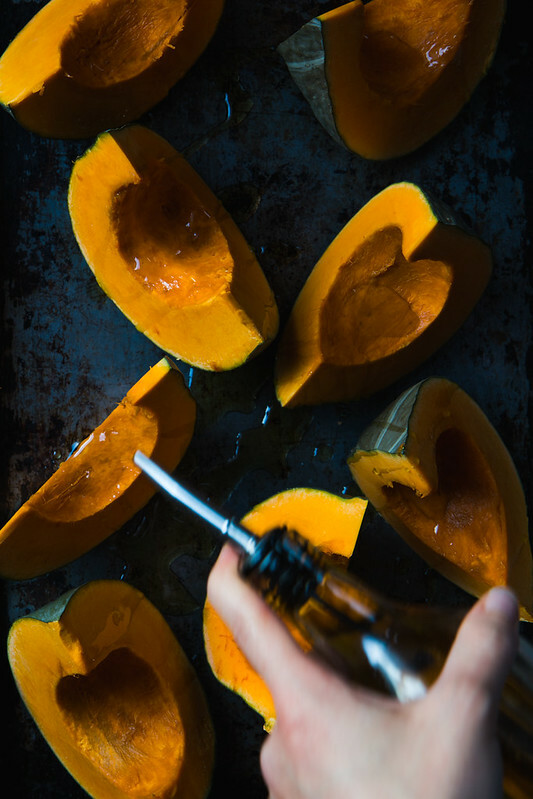 If you can’t get your hands on a kabocha squash, you could substitute any other squash you like — sugar pumpkin, butternut, buttercup, or even sweet potatoes if you prefer them. However, I highly recommend trying to hunt down a kabocha if you can. 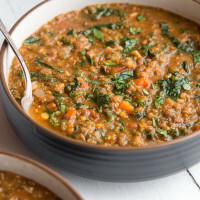 They’re quickly becoming my favorite variety, and once I get past making batch after batch of this soup, I plan on experiment with other uses for them. Those experiments will have to wait for 2016, though. 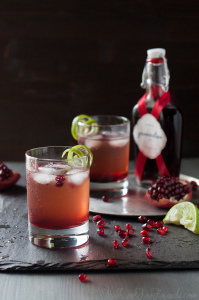 Just a couple more days before the calendar turns over, meaning this will be my last recipe of 2015. I can’t think of a better note to end things on. Let’s just hope the new year is as delicious as the last. Remove the stem, and cut the squash into wedges. Scoop out the seeds and stringy insides, and discard them. Place the wedges cut-side up onto a foil lined baking sheet, drizzle with 1 TBSP olive or coconut oil, and sprinkle with a generous pinch of salt. Roast the squash for 30-40 minutes, or until tender. Remove from the oven and let rest until it is cool enough to handle, then scoop the meat away from the flesh. In a large pot or dutch oven, saute the onion with 1-2 TBSP oil for 5-7 minutes, or until translucent. Add the garlic, curry powder, cumin, cinnamon, ginger, turmeric, and a pinch of salt, and cook for another 1-2 minutes, or until the spices are fragrant. 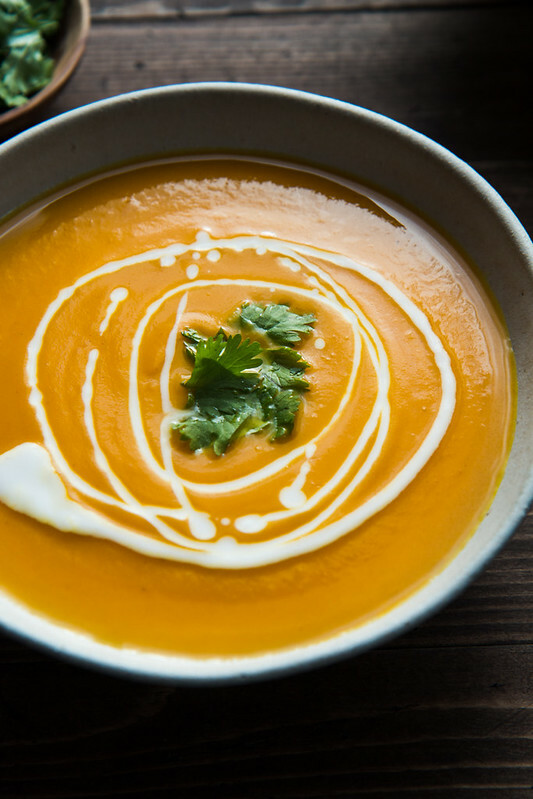 If you have an immersion blender, add the cooked squash and 4-5 cups vegetable stock or water, and puree until smooth, adding more liquid as needed to reach the desired consistency. OR, transfer the cooked onions, squash, and enough vegetable stock or water to blend, to an upright blender and puree until smooth. You may need to do this in batches. Return to the pot and add additional liquid as needed to reach the desired consistency. You can add the coconut milk now, or reserve it for drizzling over the soup later (or add some now, and some later). Add salt to taste, and adjust the level of heat to your liking by adding more curry powder or more coconut milk if needed. Serve with fresh cilantro, and wedges of lime if you'd like a little acidity. *the amount of curry powder you need will depend on personal preference, and also how hot your curry powder is. I used a combination of hot and sweet curry powders for a well rounded, not too spicy flavor. If you're not sure about the level of heat, start with less, and add more as needed at the end of cooking. Soup will keep for about a week in the fridge, or can be frozen. Can’t talk. Gotta go buy some pregnancy pants. Haha, seriously! They’re like yoga pants, except you can get ones that look like a regular pair of jeans. NO ONE HAS TO KNOW. I’m very familiar with family-in-laws trying to force feed you until the point of explosion. Love this soup! Haha, it’s a serious issue, isn’t it! Thank goodness for soup! I was looking for something to make with a kabocha squash I had on hand, and this fit the bill perfectly. Thank you for sharing, I really enjoyed making and eating this. Thank you, Lena, I’m so glad you liked it! Wow this looks DELICIOUS! Since moving to Switzerland they seem to have a TON more squash available and I’ve loved experimenting with different kinds. As always this looks stunning! Sounds like you had a lot of good food over the holiday season! Wishing you a happy new year as well! Thanks, Lauren! Happy new year to you as well! I’m all about the soups right now! And this one is hitting the spot! Pass me a big spoon, would you? Thanks, Debbie! I hope you try this one, it’s definitely a keeper! Beautiful! I love that you added a Thai twist to this soup! I bet it’s fabulous!!! Kabocha squash is by far my favorite. I have this habit of roasting a bunch of them and storing them in the freezer for adding into my breakfast oatmeal, making smoothies and soups. You are right about squash and curry being a great pair! I’m going to have to try this soup soon. Too bad my kabocha squash went bad, but I am going to try this with butternut this time. Any suggestions as to what to serve it with for dinner? I’m sure it will be great with butternut, too! Hmm, that’s a great question. 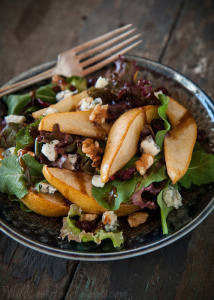 Personally, I love a light dinner of just soup and a salad (like this Roasted Pear and Gorgonzola Salad), but if you’re looking for something with a little more protein, I really like this simple Maple Glazed Salmon with Farro. Both are pretty easy to throw together. Hope that helps!